The Red Sox didn’t change much from their World Series winning 2018. Alex Cora did announce a change, where he will bat Mookie Betts second, leading off Andrew Benintendi. This is an optimal move when looking at the analytics of a batting order. The big bat of the bunch is J.D. Martinez, hitting third. He will look to have another 40+ home run season. Xander Bogaerts benefitted from Martinez’s arrival, and will be batting cleanup again this season. 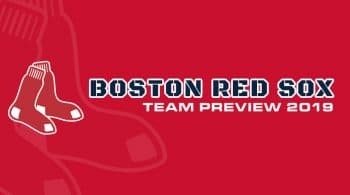 The back half of the lineup is also strong, and Boston will also get the return of Dustin Pedroia. Mitch Moreland will platoon with Steve Pearce, as Pearce continues to be one of the better bats against left-handed pitching. If Rafael Devers makes a jump, then we will be looking at another piece on top of an already loaded offense. 4/17 @ NYY L 3-5 Nathan Eovaldi N. Eovaldi (R), 6 IP, 6 SO, 0 ER, ND Mookie Betts M. Betts Xander Bogaerts X. Bogaerts J.D. Martinez J. Martinez Steve Pearce S. Pearce Mitch Moreland M. Moreland Dustin Pedroia D. Pedroia Rafael Devers R. Devers Christian Vazquez C. Vazquez Jackie Bradley Jr. J. B. Jr.
4/16 @ NYY L 0-8 Chris Sale C. Sale (L), 5 IP, 6 SO, 4 ER, L Mookie Betts M. Betts Xander Bogaerts X. Bogaerts J.D. Martinez J. Martinez Steve Pearce S. Pearce Mitch Moreland M. Moreland Eduardo Nunez E. Nunez Rafael Devers R. Devers Sandy Leon S. Leon Jackie Bradley Jr. J. B. Jr.
Fresh off a World Series win, Boston will return the same rotation they ended with from 2018. After trading for Nathan Eovaldi last season, they have signed him long term. He will be a back end of the rotation starter, and really showed he could hack it in the league after a long career of recurring injuries. Boston will likely be careful with the power armed right-hander, and projections have his innings a bit limited, which makes sense given they have depth and will take it easy with his history. Working up the rotation, Eduardo Rodriguez continues to develop as a quality mid-rotation arm, but injuries continue to limit him from pitching a full season. It will be hard for Boston to rely on Rodriguez for a full year, but they are better suited to deal with what should be a looming injury. Rodriguez had 146 strikeouts in 129 innings last season, winning 13 games with a 3.82 ERA. Boston would gladly take that, but getting to the 150 inning mark would be an even better goal. Brian Johnson and Steven Wright would be a few names in long relief that will make some spot starts as well. Boston’s big three consist of Chris Sale, Rick Porcello, and David Price. Sale pitched 158 innings last season, and he continues to show some sluggishness towards the end of the season over the last two years. This is a bit of a concern, but he was his usual self when healthy. He had a sub-2.50 ERA and boasted 237 strikeouts. Sale is one of the league’s best pitchers, and a tremendous ace to lean on. With his durability starting to become a question mark, Boston will have to keep a closer eye on him. Rick Porcello continues to be a huge innings eater, and a quality start machine. He was a strikeout per inning guy last season, winning 17 games. We shouldn’t expect much of a change for Porcello’s numbers this season, although you can expect the occasional blow up. David Price was a near World Series MVP, and really turned back the clock. Overall Price was very solid, and turned in what was really his most productive season in a Boston uniform. If Price pitches like last season, this Boston team has a better chance of duplicating their success.